Albuquerque, NM – Nestled at the foot of the picturesque Sandia Mountains is the beautiful southwestern city of Albuquerque, New Mexico. While Albuquerque is well known for its annual hot air balloon festival and as the home of motor racing royalty, the Unser family, Albuquerque also has a darker distinction: It is the Late-Term Abortion Capital of the United States. Since 2010, Operation Rescue has worked with local activists Bud and Tara Shaver, to expose abuses at Southwestern Women’s Options (SWO), the largest late-term abortion facility in the U.S. We have repeatedly exposed the link between SWO and the University of New Mexico (UNM), which used tax dollars to expand abortion in New Mexico. Rep. Marsha Blackburn, who chaired the Select Investigative Panel on Infant Lives that looked into the illegal trafficking of aborted baby remains, will be in Albuquerque this week to address her Panel’s findings and concerns about the Southwestern Women’s Options abortion business and its questionable relationship with the publicly University of New Mexico. With the aid of pro-life activists, Blackburn’s investigations revealed disturbing facts that resulted in two criminal referrals of Southwestern Women’s Options and UNM to State Attorney General Hector Balderas for further investigation and prosecution on charges they violated the state anatomical gift act and failed to provide legally-required informed consent to women. Here are a few important things to know about the late-term abortion business at Southwestern Women’s Options and Blackburn’s findings. 1. The vast majority of Americans oppose late-term abortions. A Gallup Poll taken a few years ago indicated that 80% of all respondents were opposed to abortions in the third trimester of pregnancy. It found that 64% of Americans oppose abortions in the second trimester of pregnancy. This makes New Mexico’s “wild west” abortion policy one of the most radical and unpopular in the U.S.
2. New Mexico is one of only nine states (and the District of Columbia) where there are no gestational limits on abortion, which can be legally done throughout all nine months of pregnancy. Because of the strong public opposition to second and third trimester abortion, there are only a few locations where such a business can thrive. Albuquerque’s Southwestern Women’s Options, the largest of only five free-standing abortion facilities in the U.S. that openly conduct elective abortions into the third trimester. In addition to no gestational limits on abortion, there are no significant laws restricting abortion whatsoever in New Mexico, neither are there law requiring abortion facilities to meet minimum health and safety standards. This lack of accountability has made New Mexico an “anything goes” state that served as an incubator for criminal conduct. 3. Southwestern Women’s Options founder, Curtis Boyd admits he kills a baby during an abortion. Curtis Boyd of Dallas, Texas, is the owner of Southwestern Women’s Options in Albuquerque. Early in his career, he experimented on women to develop new second trimester abortion techniques. 4. During late-term abortions, labor is induced and women are forced to deliver often intact dead babies. For any woman who has given birth to a child, the realization of how late-term abortions are done can be chilling. SWO uses the Induction Abortion Method developed by the infamous abortionist George Tiller. It is a two to four-day process, depending on the gestational age of the baby. 5. Digoxin doesn’t always work. According to literature on the subject, Digoxin injections can take up to 24 hours to kill the baby in the womb, and it doesn’t always work the first time. The injections fail about 13% of the time even under the best circumstances, and if the drug is injected into the amniotic sac instead of the fetus, the failure rate on the first try can be as astronomically high as 70 percent. This can lead to the complication abortionists dread the most: the live births of late-term babies during abortions. The Born Alive Infant Protection Act mandates care for infants born alive during abortions. However, they are more likely left to die from neglect, or are intentionally murdered as in the case of convicted killer Kermit Gosnell. 6. One Southwestern Women’s Options abortionist was once accused of killing a baby born alive during an abortion. In 2008, a former employee of Women’s Health Care Center, a now-closed late-term abortion facility in Wichita, Kansas, described to Operation Rescue an experience she had while assisting abortionist Shelley Sella with a 35-week abortion. 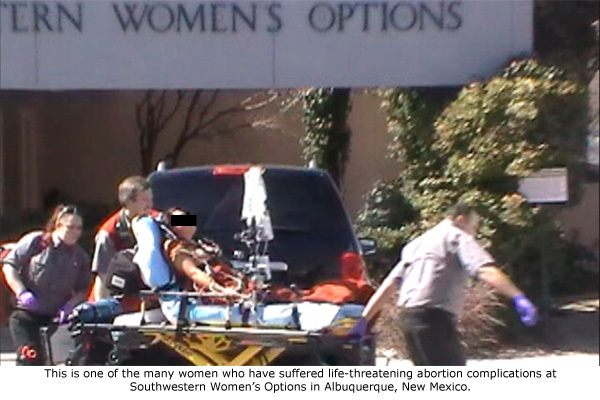 Sella has been employed to conduct abortions at Southwestern Women’s Options in Albuquerque, New Mexico, since 2009. Sella’s former colleague explained that when the nearly full term baby was delivered, she noticed the baby moving. Sella looked up at Ms. David, then picked up a utensil and stabbed the baby in the left ribcage, twisting the utensil until the baby quit moving. Operation Rescue reported the suspected murder to the Wichita Police, but under questioning, the frightened witness recanted. The baby’s body had been incinerated, destroying the only evidence of the alleged crime. Did Shelley Sella get away with murder? That’s a question that might never be answered. 7. Southwestern Women’s Options is the largest supplier of aborted baby organs and tissue to the University of New Mexico’s Health Sciences Center. UNM collected hundreds of aborted infant remains during 39 procurement sessions since 2010, (about once every six weeks). Those babies’ gestational ages ranged between 11.5-30.5 weeks. Collected remains included: brain/head, heart, lung, eyes/retina, kidney, spleen, adrenal gland, intestines, bone marrow, and stomach. In a video-taped confession, Dr. Phillip Roth, Chancellor of the University of New Mexico Health Sciences Center and dean of the School of Medicine, confirmed publicly that whole brains from aborted babies were used for dissection by “summer camp” students. UNM also acted as a distribution hub for aborted infant remains procured at SWWO, which were sent to other institutions such as the University of Florida, University of California San Francisco, and the University of Ottawa in Canada. 8. Medicaid will pay all costs to Southwestern Women’s Options to abort babies even in the third trimester. Both Southwestern Women’s Options and the UNM are the recipients of state tax dollars. A video just released by Abortion Free New Mexico shows that Medicaid pays for all costs of an abortion in New Mexico using tax-payer funds. Posing as a woman who wanted to abort her 30-week Down syndrome baby, Abortion Free New Mexico’s Tara Shaver recorded Southwestern Women’s Options explaining that Medicaid would cover the entire $15,500 abortion fee. This is not only offensive to most tax-payers, but is also offensive to those who oppose the use of abortion to deprive special needs babies of their right to life. Such were the words of George Tiller, a late-term abortionist who trained two of Southwestern Women’s Options abortionists. Southwestern Women’s Options employs the abortion technique developed by Tiller. An abortion consent form used by Southwestern Women’s Options describes risks of the very late abortions that are dangerously done in their out-patient clinic, which is ill-equipped to cope with the frequent life-threatening complications that occur there. Tara Shaver was able to document numerous 911 calls placed by SWO over a brief couple of years until the City of Albuquerque stopped honoring her legal requests for public information. One of those incidents involved a ruptured uterus during a 35-week abortion conducted by Shelley Sella that the patient just barely survived. Shaver and Operation Rescue filed complaints against Sella for conducting an abortion at 35-weeks using the Induction Abortion method even though the patient had a history of a recent previous caesarean section delivery, which left her at high risk of rupturing her uterus during the strong contractions of labor — something SWO is unequipped to handle. The case finally went to a full hearing where discipline was recommended, according to transcripts obtained by Tara Shaver. However, when the final decision came out, Sella was surprisingly exonerated. In the process, the Board essentially lowered patient care standards for late-term abortions from the higher accepted obstetrical standards Sella admittedly violated. This action has only served to increase the risks to patients that they will suffer life-threatening abortion complications that Southwestern Women’s Options still is not equipped to handle.